CityU Case Competition is back again! The theme this year is product marketing. For an outstanding product marketer, sensitivity to the industry trend and excellent analytical skills are necessary. 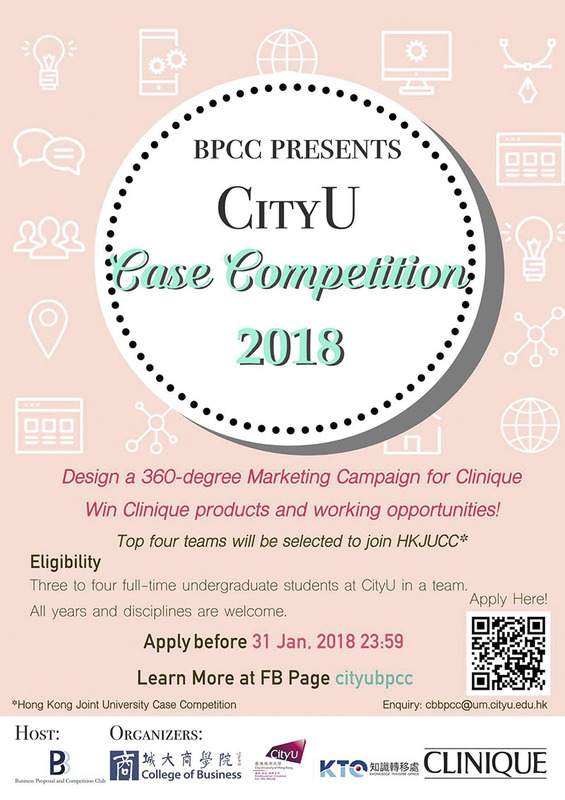 This year, we are glad to have Clinique, the leading brand in cosmetics industry, to offer us a real product launching scenario and related analytical data.The top four teams will be selected to represent CityU to participate in HKJUCC (Hong Kong Joint University Case Competition), which is hosted by HKU International Case Society. Selected teams will be given a chance to compete with talents from HKU and CUHK! If you have any enquiries, you can contact Joanne (5429 9897)/Cherie (9234 3400). Join us and show us what you've got!